Just over a month ago, I realized that I was doing the right thing by protecting the value of Magic: The Gathering products in my store and being consistently punished for it. I resolved to blow a bunch of this stuff out at market price and change my ordering behavior going forward to better reflect the new reality. I embraced the salt for my advertising campaign. It was a lot of fun. Even at below-market prices, demand is not infinite. We put a bunch of stuff out on the table, but the centerpiece was 20 of my 30 remaining Modern Masters 2017 booster boxes, marked at $175 plus tax. In a week and a half, with lots of paid advertising, we sold 11 of the 20 boxes. Bad transactions drive away good transactions. A customer came in looking to buy two non-discounted Standard booster boxes and a Bundle (Fat Pack) but decided to buy one of our discounted Modern Masters boxes instead. Several days after the sale ended, a customer came in looking to buy two of the discounted MM17 booster boxes, but finding that they were no longer on sale, chose instead to spend $400 on singles. Which transactions would YOU rather encourage? They’ll always want just a little bit more. Several customers became quite grumpy that we wouldn’t, for example, sell them four booster boxes at $150 each. Everyone gets this sort of negative customer interaction once in a while, but we had more of them during this sale than we’d had in months prior. Opportunists will seek ways to take advantage. 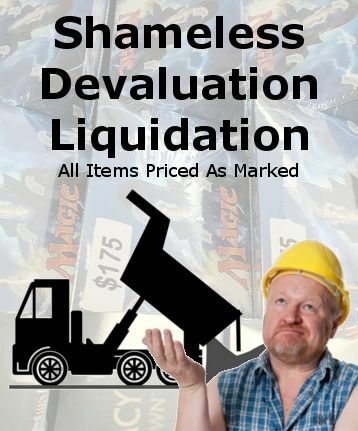 A couple of our purchases involved a customer buying a box, sitting down to bust the packs, bringing all the rares to the counter to trade them in, and becoming dismayed that we’d dramatically dropped the trade value on the set’s singles in anticipation of this sort of behavior. More negative customer interactions. More disappointment. Some retailers will throw around the #notmycustomer hashtag, but it remains that my relationship got worse with people whose money I’d like to have in the future, and the blame lies with me for sending inconsistent messages about our value proposition. The performance of the product was irreparably harmed after the sale. We’ve sold zero MM17 booster boxes since the end of the sale, and last month’s sales of MM17 booster packs dropped by 70%. If the product was a poor performer before the sale, it’s a total dog now. We still have about 18 booster boxes of Modern Masters 2017. At this rate, we should run out in early 2019. To think: I could have had 100+ more boxes! The publisher and my distributors would have gleefully enabled my bankruptcy. It’s not their jobs to look after retailers, and we must remember that. In Part II, I’ll talk about the way to move forward. The obvious answer seems to be, “Don’t order as much stuff.” There’s a little more to it, and some helpful resources that will help you know when to tread cautiously.